Now that September has arrived, you may be feeling the need to get your home ready for fall. With the kids going back to school and life becoming busier by the day, there’s no time like early September to start! 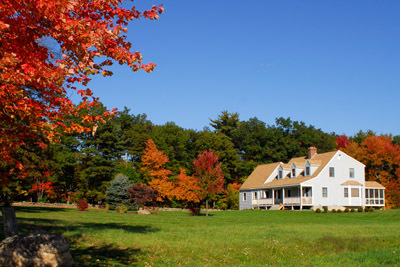 Here is your homeowner’s checklist to ensure your nest is ready for fall. Closet Clean Up: Out with the shorts and in with the sweaters. Prep your closet for the fall and winter season by packing away your summer clothing and unpacking your fall layers. While you’re at it, take time to clean out your closet and donate any old/unwanted clothes. Brighten Up Decor: As the weather cools down, you will find yourself spending a lot more time indoors. Why not brighten up your décor by dressing up your mantle, adding a fresh coat of paint to kitchen cabinets or DIY-ing your very own fall wreath? Check out these 10 cozy home ideas for fall for inspiration! Add a Mudroom: Fall means boots, coats, backpacks, dirt and leaves. If you do not already have a mudroom in your home, create a designated place by the entry way of your home for your family to leave their belongings in order to keep the outside from coming in. Install Window Treatments: Keep those cool seasonal drafts out of your home by installing window treatments. Adding new shades, curtains, or blinds to the windows will help add some décor and can even help lower your energy bill. Keep Warm: As it gets colder, it is of the upmost importance to keep warm. Make sure your furnace is ready by having a professional inspect it and invest in a programmable thermostat to keep the heating bills under control. Get Your Hand in The Gutter: It is important to check that your gutters are not worn or damaged before the fall and winter seasons start. As fall approaches, be sure to inspect and clean out your gutters and downspouts. Do this periodically as leaves and twigs fall throughout the season. Check the Roof: Give your roof a close up, visual inspection. Check for any warning sings such as cracked shingles, rust, or leaky vents and remove any leaves or debris as well. Close the Pool: Sadly, fall means it’s time to close up the pool. Don’t forget to give a professional a call and schedule a date to do this before temperatures dip. Leaf Maintenance: While raking leaves may not be your favorite task, it is still an important check point on the homeowner’s fall to do list. Make sure you have all of the proper tools (usable rakes, leaf blowers, large garbage bags, etc.) ready to go in the shed. If you don’t feel like throwing your leaves into garbage bags this year, why not start a composite pile? Click here to learn how to compost this season. Seal Windows/Doors: Keep the cold out by ensuring your windows and doors are sealed properly. Try lighting a candle near the edges of windows to see if the flame flickers. If so, it is likely you have a draft. Replace any necessary seals and repair caulking around doors and window frames. You can also refer to the above and invest in some heavy window treatments to help keep cool air out.